Solar Grid Tie System - Combining solar with grid power. A Solar Grid Tie System answers a lot of issues about going solar. Tied to the grid, a residential solar power system costs less to establish but still offers the green alternative. Grid tying has become a mainstream way to get onto the solar bandwagon. Rather than severing all ties to the grid you can supplement your home energy needs with solar power and stay tied to the grid. There are several advantages to you (discussed below) to tying into the grid. Savvy power companies ofer "net-metering", a system by which the company will use (sell to your neighbors) any excess power you make and pay you for it, on the other hand they'll provide (sell) power to you when your system isn't making enough. The advantage to the power company is that they don't have to build another expensive power plant to keep up with growing demand. Energy demand on any power grid is highest during the day and evening hours (particularly in the summer when air conditioners are running). That's right about the time your solar system is generating the most electricity. With a solar grid tie system you can have it all, a reduction in power bills and greener energy without the substantial costs. Choose a size that suits your budget. Additionally, a grid tied system doesn't need batteries and they're available in pre packaged systems in a variety of sizes. 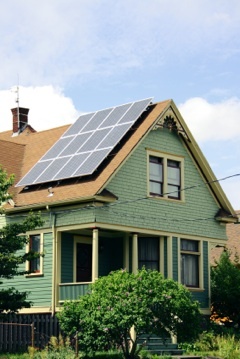 Many Countries, States, Provinces and Municipalities are encouraging the use of solar power by offering subsudies, grants and tax credits to homeowners who install a home solar power system. This "best of both worlds" scenario is great for those who want to use solar power but don't want to spend $30,000.00 on it. Cost - Grid tied systems can be much smaller in size than an off grid system which means, much less expensive. Buy the size you can afford and make sure that you will be able to connect more solar panels to your system in the future if you so choose. Sizing - It's as easy as buying a home solar power system that you can afford. Since you won't be converting all of your energy to solar, it isn't necessary to accurately size your system to cover all of your energy needs. Your home will use solar energy when it's available, and when your panels aren't producing, the grid will take over. No Batteries - Batteries are a significant expense and no matter how well you maintain them they will need to be replaced, on average, every 5 years. Also,batteries require more maintenance than any other part of your residential solar power system. A grid tied system doesn't require energy storage for times when the sun isn't shining. Basically the grid is your back up system. Plug and Play - Solar grid-tie packages are available that include everything you need to get set up. Just choose a size and an installer. No Blackout Protection - Because a grid tied system has no battery storage, if the power goes out in your neighborhood at a time that your solar panels are not producing energy (night), your power goes out too. Ensure that your power company allows grid tied systems. Not all companies are on board or equipped to allow tying into their grid. Visitors to our Solar Grid Tie System page may also be interested in the following pages.